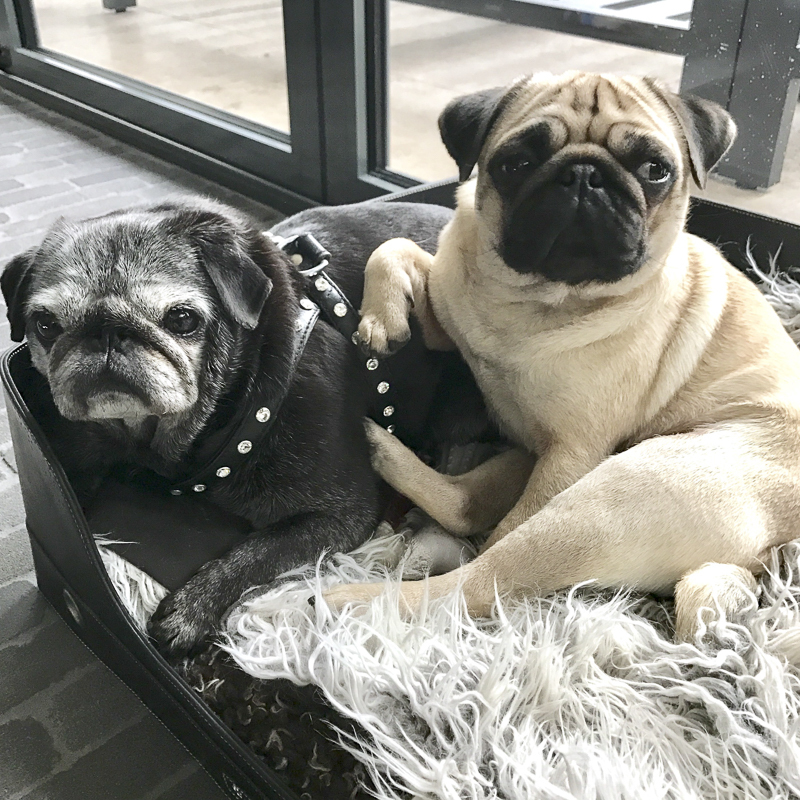 We are kicking off 2017 with the return of our most popular series, the Social Pug Profile. 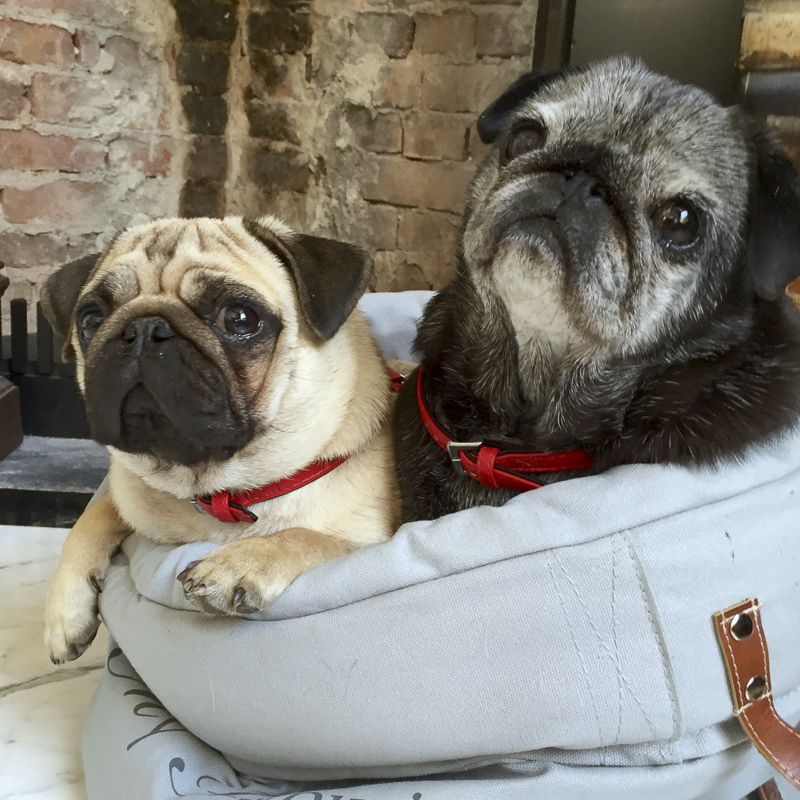 First up we have the ever so popular and full of life Fien + Rosie, The Dutch Pug Sisters. 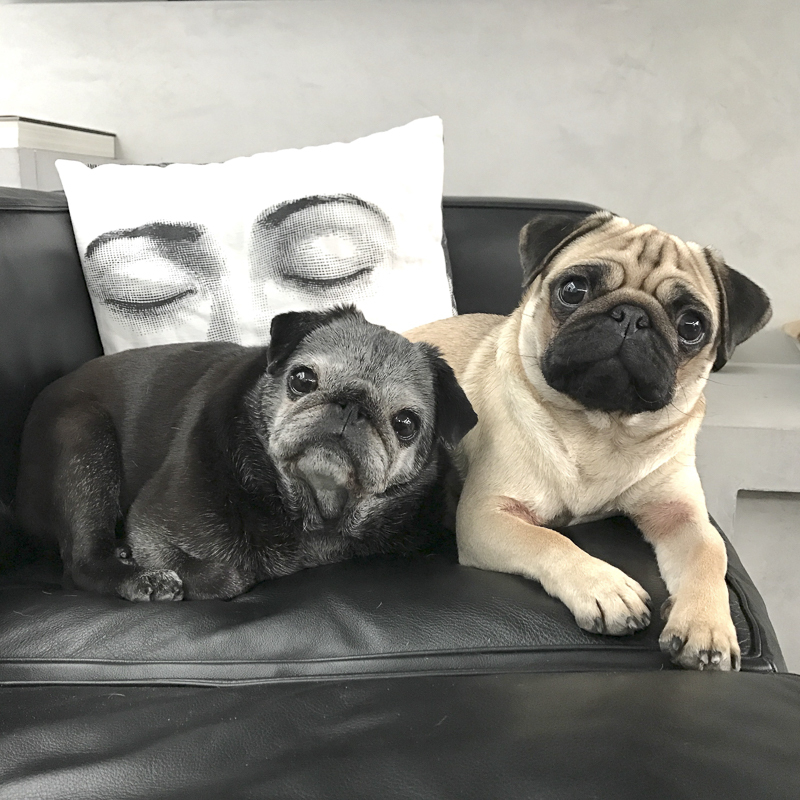 Get to know this dynamic duo in their Social Pug Profile interview. Fien: Josephine, but everyone calls me Fien. You all know the story about Josephine Bonaparte? 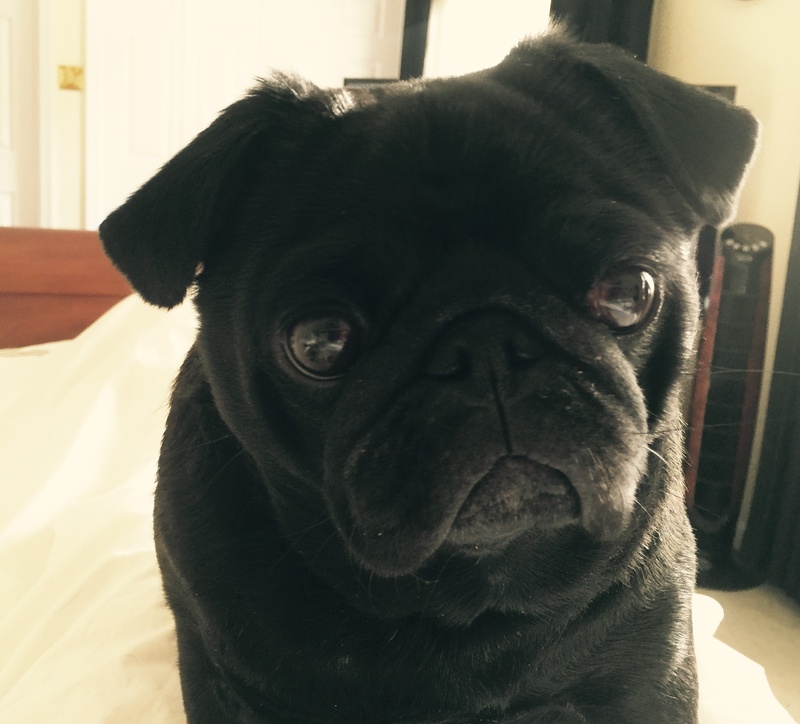 She had pugs and at her wedding night she preferred her pugs in bed (instead of Napoleon). Mom finds that’s a very funny story! That’s why she called me Josephine/ Fien. Rosie: My name is Rosie! Just Rosie. Mom says Rosie means something like Rose, you know, the flower? So I guess it’s because I look like a flower. Rosie: I’m 1,5 year old, so technically I might be still a puppy but I think I’m pretty precocious, so I’m nearly a grown up! Fien: We live in a small town that’s called Vught..
Fien: …and The Netherlands is a small country in Europe, close to Germany and Belgium. Rosie: …But that’s only because he gives us a snack when he says goodnight. Rosie: “Enjoy your meal!” because that means breakfast- and dinner-time! Rosie: Apple, cucumber, bananas, egg, and all different kind of snackies! Fien: No not really, I like all kind of toys, especially when they’re fluffy! 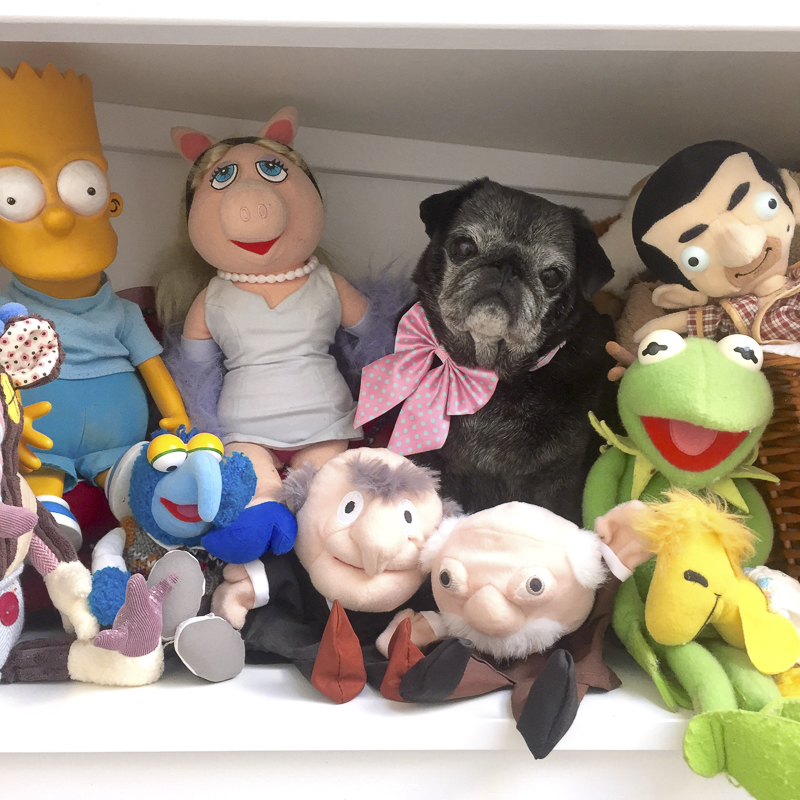 Rosie: This is a difficult question for me, because I have soooo many toys. Every month I have a different favourite toy! Fien: When mom finally sits down on the sofa, and I cuddle up with her and Rosie..
Rosie: I love it when the doorbell rings! Then I can jump to greet the guests. Fien: You’re not allowed to jump Rosie! Rosie: That is my way to say Hello! Rosie: No, I don’t think I have any bad habits! Fien: Yes you do too Rosie!! You always push me aside! Or you sit on me! Rosie: Is that a bad habit? 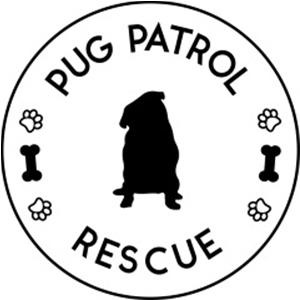 Fien: I think I’m a very reliable pug. Mom and dad can really count on me. And so can Rosie. Rosie: I find ‘reliable’ a difficult word. My best quality is that I can run really fast. And I can eat even faster! Fien: Rosie, I don’t think that’s a “quality” but never mind. Fien: We wake up, and we’ll wait for dad, because most of the times he gives us our breakfast. Rosie: ..We’re very happy when he shows up.. not only because he gives us our breakfast but also because we lick and finish dad’s yoghurt bowl, so yummy! 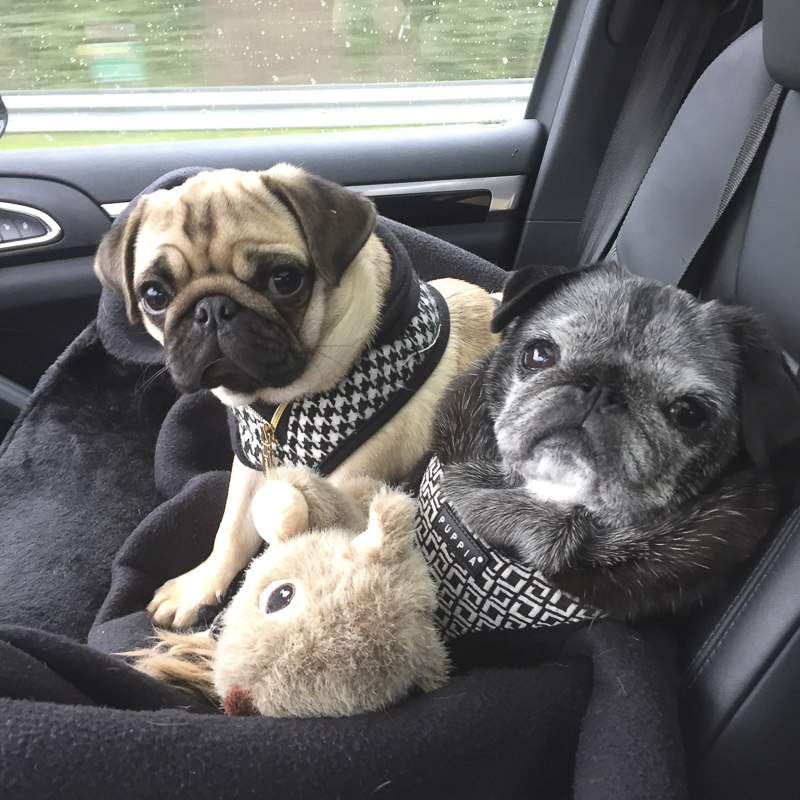 Fien: The rest of the day, we play, and nap and cuddle, and take a walk with mom, and during our walk we always do some shopping with mom. Rosie: We meet a lot of people during our walk and everyone seems to love us. 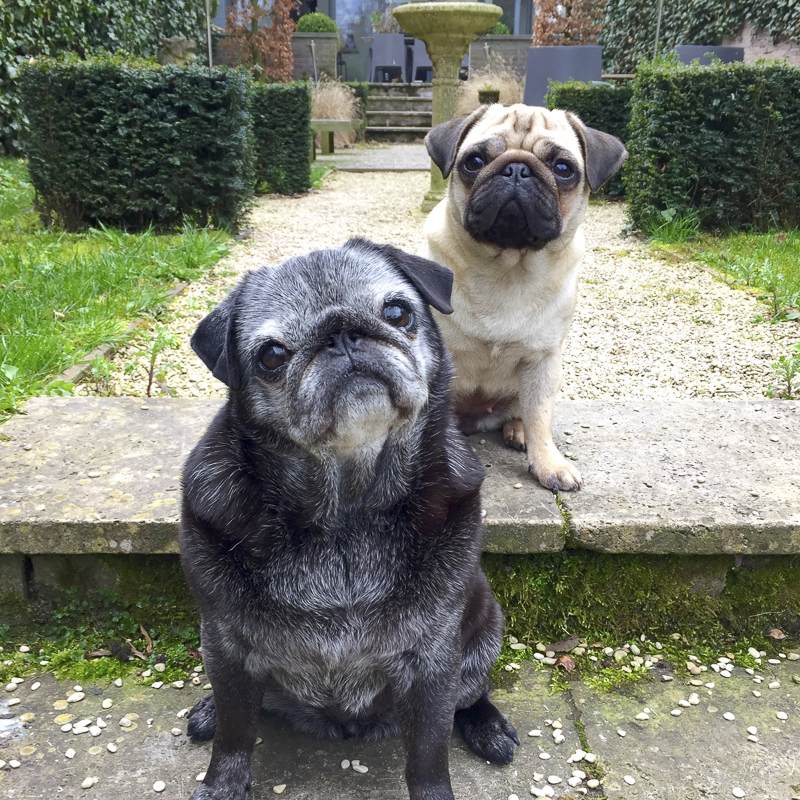 Fien: In the afternoon we play some more and we nap some more..
Rosie: …and then we wait for dinnertime… Fien and I love dinnertime! Fien: After dinner we cuddle up with mom on the sofa, we don’t want her to move! What has been your most favourite adventure that you have been on? Fien: I’ve been to Paris! A long time ago, with mom and dad, when Rosie wasn’t born yet. I’ve seen the Eiffel Tower! Fien: Answer the question Rosie: what was your best adventure? Fien: We receive lots of Private Messages from people who say they love us and that we make them so happy! I feel very fortunate to be able to make people happy and to bring a smile to their faces! 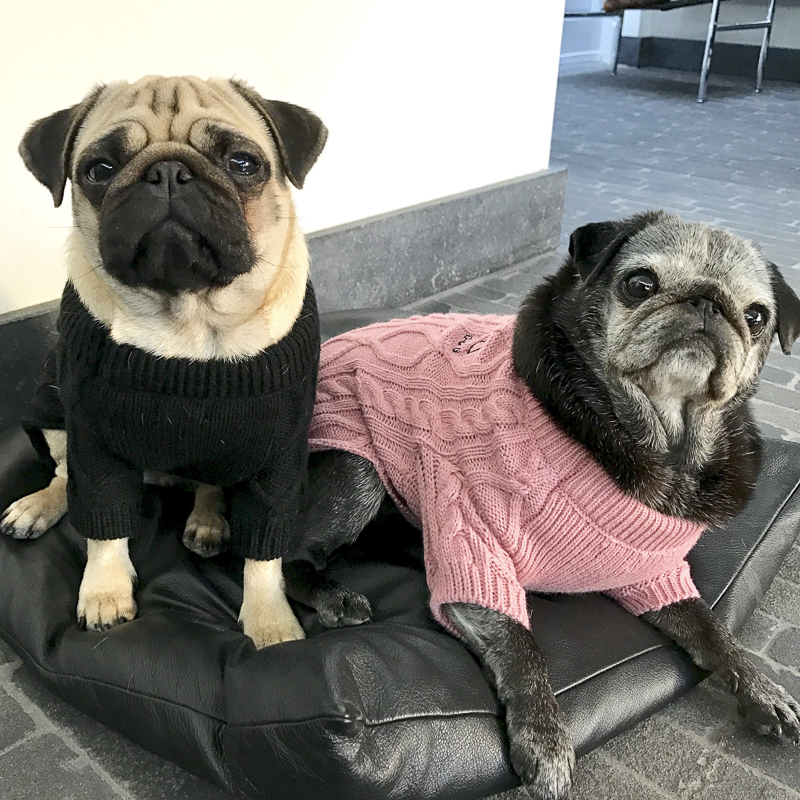 Rosie: I like our Instagram Account because mom needs to make pictures of us and there are a lot of snackies involved! Rosie: It’s called that way because we’re Dutch. 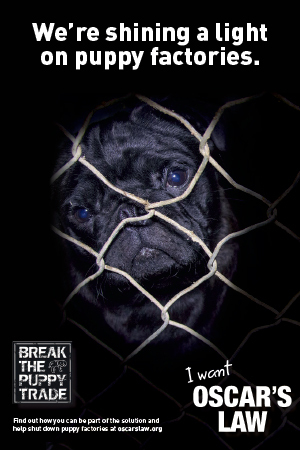 And because we’re pugs. And also because we’re sisters. 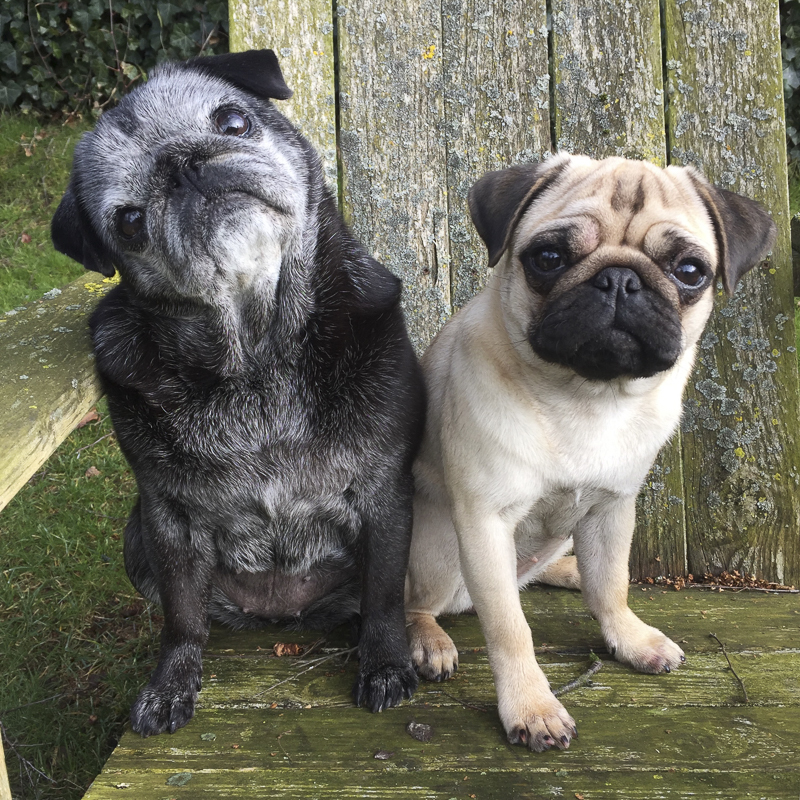 I hope you have enjoyed getting to know Fien & Rosie in this Social Pug Profile interview and be sure to leave a pug love note for them in the comments below. 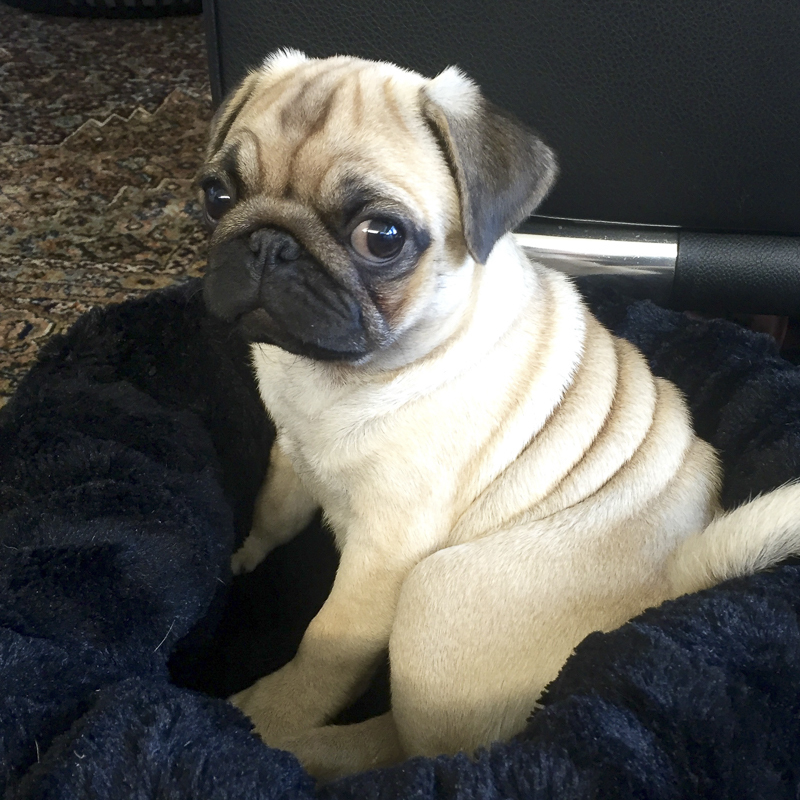 My name is Olive! ?